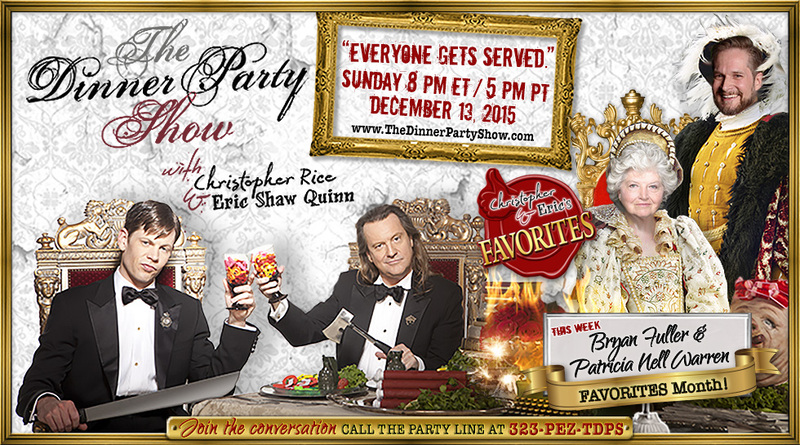 Favorites Month continues as Bryan Fuller and Patricia Nell Warren, two of Christopher and Eric’s favorite guests, return for an all new livecast of The Dinner Party Show, this time to discuss their favorite books, movies and T.V. shows. It’s all leading up to a special pre-Christmas announcement from Christopher and Eric at their TDPS Holiday Party on December 20th. Until then, the dubiously qualified experts and special correspondents for “The Dinner Party Show” offer their idiosyncratic holiday greetings in a manner you’re not soon to forget.